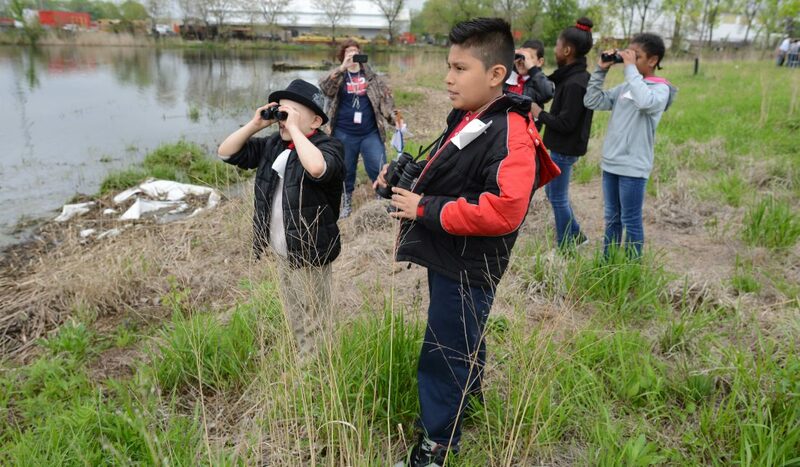 Schoolchildren once again got the chance to explore and learn from the environmentally remarkable Grand Calumet River at the remediated Roxana Marsh in northwest Indiana. Seventy students from fourth and sixth grades at Harrison, McKinley and Carrie Gosch elementary schools worked one-on-one with scientists and experts doing activities like fish identification, macroinvertebrate sampling, bird watching, and tree planting. The mayor of East Chicago Anthony Copeland even stopped by and helped the students plant a swamp white oak, a tree native to the area. For a long time, the Grand Cal was referred to as the most polluted river in America. Through Great Lakes Legacy Act funding, almost 2 million cubic yards of river and wetland sediment have been removed or capped and 84 acres of habitat have been restored, including Roxana Marsh. Carrie Gosch Elementary sixth-grader Gerald Lewis was impressed by all the birds and insects and fish he saw. But his new-found interest in the environment didn’t end there. It made him want to do something about it. This event was hosted by U.S. Environmental Protection Agency, U.S. Fish and Wildlife Service, U.S. Forest Service, Indiana Departments of Natural Resources and Environmental Management, The Nature Conservancy, Shirley Heinze Land Trust, National Audubon Society, Northwest Indiana Regional Planning Commission, Gary Stormwater Management District, East Chicago Waterway Management District, and IISG.